NOTE: As of this posting, señor @CXHairs announced on the Facebook event page, that the camp was more than 1/3 full in less than 24 hours. Get on this! Jeremy Powers CX Camp At DCCX! 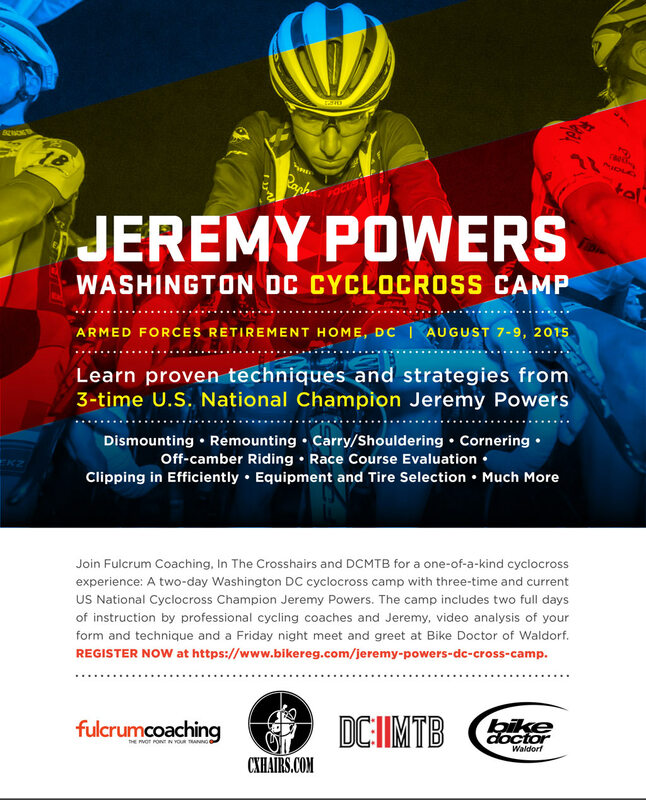 Join Fulcrum Coaching, In The Crosshairs and DCMTB for a one-of-a-kind cyclocross experience: A two-day Washington DC cyclocross camp with three-time and current US National Cyclocross Champion Jeremy Powers. The camp includes two full days of instruction by professional cycling coaches and Jeremy. The camp also includes an opening night meet & greet and cross talk at camp sponsor Bike Doctor of Waldorf. The cross talk will include a unique interactive video portion in which Jeremy will walk attendees through his experiences in World Cup and US National Championship races. Cross talk and meet and greet with Jeremy on Friday, August 7 from 7:00pm to 9:30pm at Bike Doctor of Waldorf in Maryland. Cross talk is free for camp attendees, there will be a $15 ticket price for non-campers. Registration information up soon. Cross Camp takes place Saturday and Sunday, August 8 and 9, at the Armed Force Retirement Home, in Washington DC. The camp runs from 9am to 4pm on Saturday and 9am to 3pm on Sunday. Cyclocross racing not only requires you to be in great physical shape but also relies on a unique skill set. Learning and mastering these skills will make you a better racer this cyclocross season. On Sunday we will be put the skills learned on Saturday to use on the UCI DCCX race course. On site mechanical support will be provided by Bike Doctor of Waldorf. The course and grounds will be professionally groomed for the clinic. Four coaches, in addition to Jeremy, will be in attendance to ensure each attendee gets plenty of individual instruction. The Sunday clinic closes with a question and answer period in which prizes are awarded for various accomplishments achieved during the weekend. The Saturday and Sunday camp is held rain or shine but will be canceled if there are thunderstorms. In addition to learning valuable cyclocross skills from Jeremy and our coaches, lunch, drinks and snacks will be provided. Jeremy Powers is a professional cyclist and the three time US National Cyclocross Champion (2012, 2014, 2015) with his own team, Aspire Racing. Jeremy is the top-ranked American rider and ninth ranked rider in the world. Along with being an awesome guy on and off the bike, Jeremy is an amazing teacher who thrives on getting the opportunity to share what he has learned with new and experienced racers. For more information about Jeremy visit: www.JPows.com. For more information about the camp please contact Dan at [email protected] or call 314-814-3187.